The First, Second and Third Regiments of New Jersey Volunteer Infantry were preceded by ninety (90) day militiamen. After Bull Run, the First New Jersey Brigade was officially created as part of the general re-organization of Union troops. Brigadier general Philip Kearny was appointed its commander. Over time, the First New Jersey Brigade replenished its battle strength by adding regiments to replace men lost due to disease, wounding, death, and expired enlistments. What New Jersey Regiments comprised the First New Jersey Brigade? 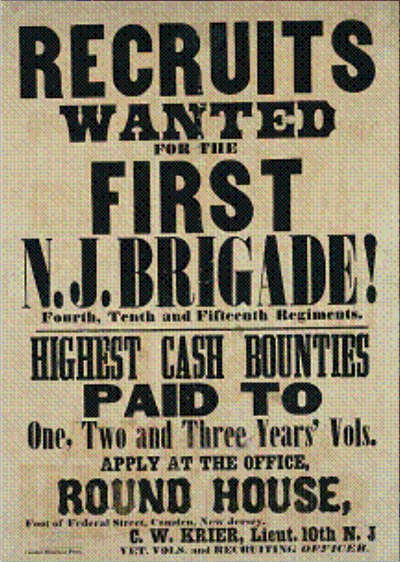 Beginning in August 1861, the First New Jersey Brigade consisted of the First, Second, Third, and Fourth Regiments of volunteer infantry. These units remained the backbone of the New Jersey Brigade until 1864 when the three-year enlistments expired. In October 1862, the 15th and 23rd Regiments were added to the Brigade. The 15th was mustered into U.S. service for three years in Flemington at Camp Fair Oaks. The 23rd was mustered into service as a nine-month regiment. The First New Jersey Brigade retained this composition until June 1863 when the nine-month enlistments expired and the 23rd N.J.V.I went home. At this time, the Brigade consisted of the First, Second, Third, Fourth, and Fifteenth Regiments. By mid 1864, the enlistments for the First, Second, Third, and Fourth Regiments expired. Only the Fourth New Jersey reenlisted in sufficient numbers to retain a distinct regimental identity. Members of the former First, Second, and Third Regiments who reenlisted were place in other regiments, most notably the 15th New Jersey Volunteers. The 10th Regiment was added in February 1864. Now at war’s end, the First New Jersey Brigade had retained its distinctly New Jersey identity throughout the entire conflict and consisted of the Fourth, Tenth, Fifteenth, and Fortieth Regiments.